Ghosting occurs when ceramic tile smothers the terrazzo underneath, causing moisture to be unable to escape the floor. This shows up as a somewhat circular pattern under the grout lines. Often times, this can be eliminated with heavy grinding. Sometimes that moisture can take weeks or even months to escape, but will almost always disappear with time. 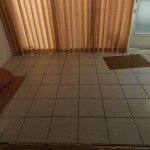 Another problem which often occurs is a grid pattern on the floor which occurs under the grout. 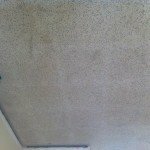 It is caused by staining from the grought itself or because of dirt travelling through the grought to the terrazzo whenever the tile floor is mopped. Again, one of the best treatments for this is heavy grinding. 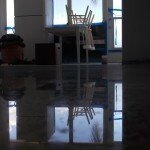 We also treat the floor after the tile is removed and during restoration with a bleaching agent. This will almost always correct the problem, although, a small light grid pattern that may remain will usually disappear within a few weeks. 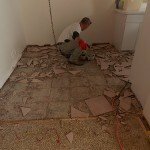 Often times, when a chipping hammer is used to remove tile from terrazzo, scars and marks are left in the floor. Sometimes they can me ground out while other times, they must be filled with an aggregate and a binder to match the existing terrazzo floor. 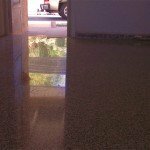 Almost any terrazzo floor can be restored, even if it has ghosting, a grid pattern, or damage from chipping hammers. You can email us at Joe@SafeDry.com or call us at (877) 824-0501.